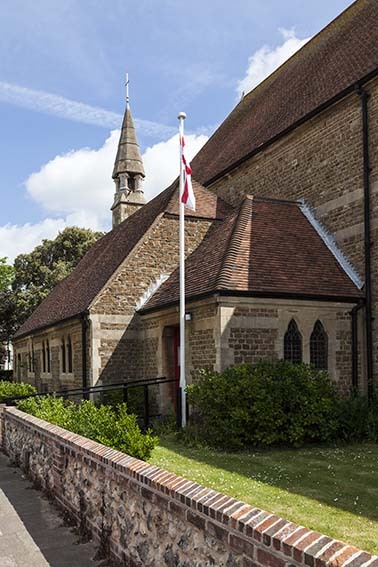 More than any other church in Worthing, St George retains its evangelical appearance and character. 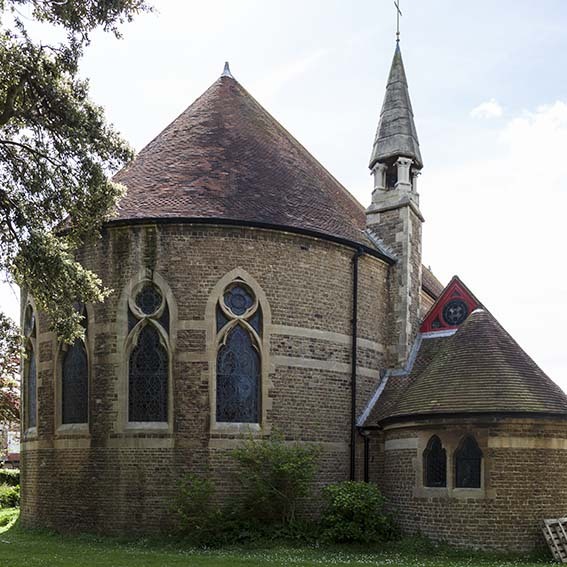 Designed by G Truefitt (B 25 p99), it was built in 1867-68 on an oblong plan with an apse; to maximise the use of the site it is actually oriented north-south. Two small much lower transept-like structures were intended, of which only the north (liturgical, actually west) one, placed unusually far towards the ‘east’, was subsequently added. This looks like a small chapel, as it too is apsidal. A tower was planned but never built, so the exterior lacks any vertical beyond a small turret with a steeply pointed top over the transept and the most immediately noticeable feature is the large roof. As engraved in The Builder (ibid p540), the tower was intended to stand ‘north’ of the nave and would have had long bell-openings extended upwards into the base of a stone broach spire. In its present form, the traceried windows leave no doubt about the function of the building, though the hipped roof of the ‘west’ end, immediately below a row of six rectangular windows, is unconventional. 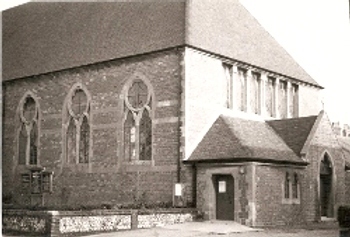 The windows are large in proportion to the building and the form of the tracery present in even the single light windows is reminiscent of Truefitt’s best known church, St George, Tufnell Park in London, which was completed in the year that this St George’s was started (personal communication from Martin Jones). The interior is a single space and thus ideal for preaching, as was the intention. As the height of the exterior walls suggests, the proportions are broad and low, with oddly squashed two-bay arcades to the transepts (the ‘south’ one remains blocked) which are supported on double-columns on pink bases which, like the painted decoration of the capitals, are clearly not in their original state. 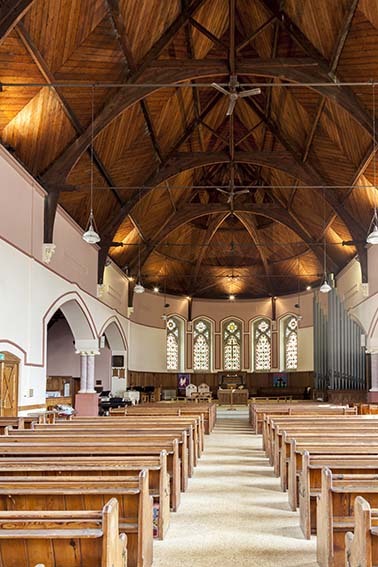 The elaborate boarded roof with curved timbers on carved corbels is a handsome structure, with particularly fine carpentry over the main apse. The open traceried screen which is now placed near the ‘west’ end of the church marked originally the entry to the chancel. Surprisingly in a church of evangelical leanings, it appears to have been part of the original fittings. The remaining fittings are generally modest and decoration was always limited to biblical texts on the wall. Truefitt added a lower ‘west’ narthex in 1875 (B 33 p807) and this probably explains the £400 recorded in PP125 as expended on restoration, on top of the £3500 spent on the building. It has a cinquefoiled doorway with a carved tympanum. It is not known when the transept was added, save that it was before 1884 (VCH 6(1) p121). 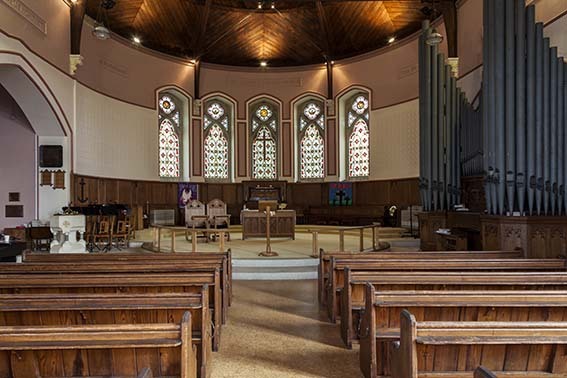 The church was re-ordered around 1968 when the screen was repositioned and again more recently when the pulpit was removed and the font put in its place. 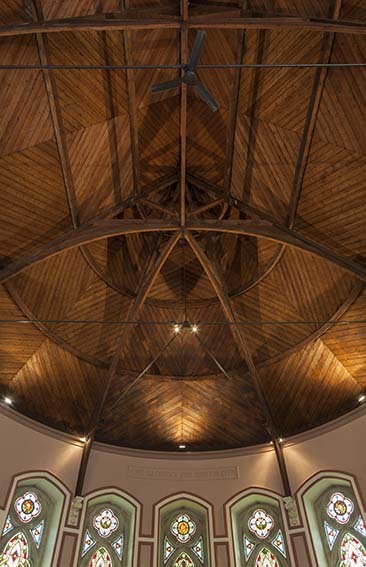 The effect has been to make good use of the open nature of the interior to create a single space for worship. Font: The bowl is octagonal with free-stading grey shafts on the stem and a cross pattee on alternate sides of the bowl. It has been moved to the position formerly occupied by the pulpit. 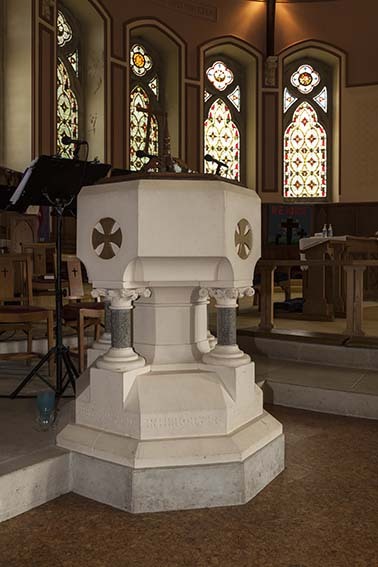 Pulpit: There was originally a stone pulpit with open arcaded sides which has now gone. Reredos: Relatively small Last Supper, which is likely to be a later addition.